Algeria star Riyad Mahrez failed to score an 85th-minute penalty as Manchester City drew 0-0 against Liverpool at Anfield. City had three previous claims for a spot-kick before Virgil van Dijk’s challenge on substitute Leroy Sane eventually resulted in one, but £60million summer signing Mahrez blazed over. It resulted in the first goalless draw between these two at Anfield since 1986 and also City’s first clean sheet at the ground since then but Liverpool manager Jurgen Klopp will be celebrating Monday’s third anniversary at the club as the happier manager. The point allowed City to regain top spot from Chelsea, who had briefly taken over after their win over Southampton earlier in the day, but their opponents dropped to third. However, the top three are all on 18 points and separated by goal difference only. Liverpool forward Mohamed Salah, who failed to score in a league match at Anfield for only the second time since Boxing Day, fired an early effort wide after turning John Stones but it said much about the first half that it was the closest either side came to threatening a goal. 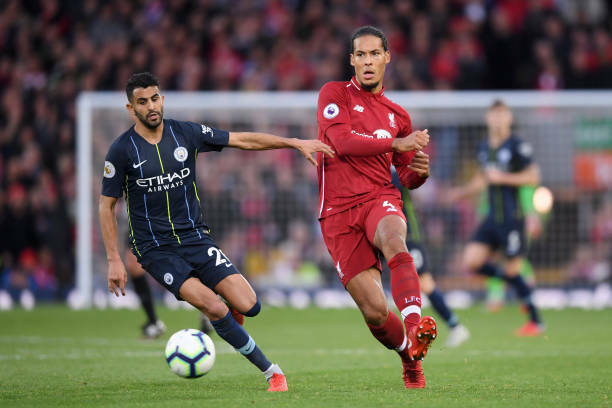 City manager Pep Guardiola his aware of how twice on this ground last season Liverpool blew them away in a 25-minute spell, appeared to have set up his side to absorb much of the early and take the sting out of Liverpool with a view to capitalising later on. went down but referee Martin Atkinson waved away penalty claims. James Milner’s hamstring injury changed the complexion of the game as City took advantage of Naby Keita’s arrival to exert their influence in opposition territory, although again without any real danger for their hosts. On the hour Sterling’s corner hit Van Dijk’s arm but Atkinson ruled Fernandinho had climbed all over the Holland international, much to the anger of City’s bench. Silva’s pass sent Mahrez, preferred to Sane, running through the middle but his angled shot rolled past the far post while a frustrated Aguero, who has never scored in his 10 games at Anfield, was replaced by Gabriel Jesus with 25 minutes remaining and retired to the bench with his hood pulled up. Having briefly escaped the smothering presence of Benjamin Mendy, Salah’s moment came when Andrew Robertson picked him out. But the Egypt international snatched at the chance with the confidence of a player with one goal in his last eight matches. 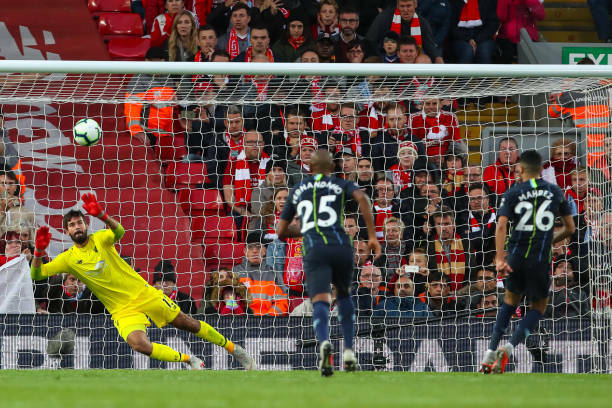 Mahrez was next to threaten, forcing Alisson Becker into a low save at his left-hand post. Jesus went down holding his face after a stray hand from Lovren but City’s third penalty appeal also went unheard, while Sturridge’s weak header was scooped up by Ederson as more half-chances came and went. Sane, who had replaced Sterling, did make the difference when his run down the left tempted the usually unflappable Van Dijk to make a tackle he probably did not have to and City finally had their penalty. 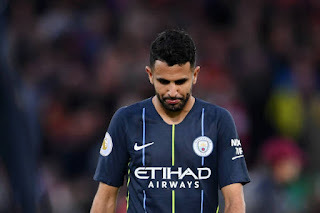 With Aguero off the pitch the responsibility was handed to Mahrez after Jesus was seemingly told to stand down, but with Alisson going the right away he blazed over, making it three failures in his last six.